In 1986, Russell Christoff, an actor and professional model, posed gazing at a cup of coffee, as if he enjoyed the aroma. The photo shoot was arranged by Nestlé Canada. Christoff was paid $250 . . . and received a contract providing that if Nestlé Canada used the picture . . . , Christoff would be paid $2,000 plus an agency commission. The price for any other use of Christoff's image would require further negotiations. Without informing Christoff, . . . Nestlé Canada used Christoff's image on the coffee brick. 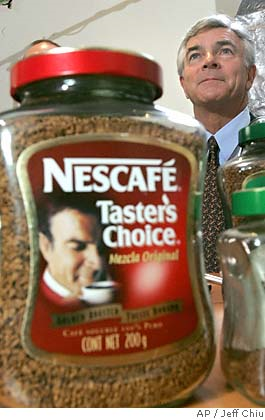 Eleven years later, in 1997, Nestlé [USA] decided to redesign its label for Taster's Choice instant coffee, which, for three decades, had prominently featured a taster, that is, a person peering into a cup of coffee. The high resolution artwork of the original taster used to produce the existing label had been lost. Nestlé . . . found instead the photograph of Christoff . . .
Nestlé decided to use Christoff's image because he looked distinguished and resembled the original taster. Christoff's photograph was youthened to make him appear younger and more similar to the original taster. Nestlé believed that it had authority to use Christoff‟s image because it had been widely used in Canada. [But it never checked.] Christoff's image was used in the redesigned Taster's Choice label beginning in 1998. . . . Images of jars of coffee bearing Christoff's image appeared [all over the place]. In 2002, a person standing in line with Christoff at a hardware store remarked that he "look[ed] like the guy on my coffee jar." A month or so later . . . Christoff saw a jar of Taster's Choice instant coffee on a store shelf and, for the first time, recognized his photograph on the label. He purchased the jar of coffee and called his agent. And his lawyer. The lawsuit was filed six years after Nestle started using his image, but one year after Christoff said he found out about it, and the main question on appeal was when the two-year statute of limitations had started to run. The Taster would thus either get nothing or get to keep the amazing $15 million that the jury awarded him for the facial misuse. If that seems like a lot — and it should — it is quite reasonable compared to what Christoff's expert witness said he was entitled to: from 5 to 15 percent of all of Nestle's profits from Taster's Choice during the six years of the Christoff Era. Christoff demanded 10 percent, or $53,101,800. Monday's decision was a mixed bag for the Taster. The court ruled that the "single-publication rule," which starts the time running when a publication is first distributed, does apply to cases of likeness-stealing. But because Nestle had used the image in different ways, the court held, that did not necessarily mean that Christoff was entirely out of luck just because the very first use was six years ago. In other words, it held there might have been more than one "publication," and remanded, telling the lower courts to figure this out. So hope remains for both sides. My favorite fact about the case remains this (again in the Court's words): "Labels bearing Christoff's image also were produced in different languages and placed on jars of coffee to be sold internationally. For the label used in Mexico, Christoff's image was altered to add sideburns and darken his complexion." So having used Christoff's image without permission, and "youthening" it in order to do so, Nestlé then—what's the word, Latinized?—it rather than pay to hire a real Latino actor to appear on its Latin American labels. The picture to the left appears to show the label, on which el Catador esta mirando a una taza de Taster's Choice Mezcla Original, como si a el le gusta el aroma. Que lástima, Nestlé. Que lástima. Link: Christoff v. Nestle USA, Inc., No. S155242 (Cal. Aug. 17, 2009). Is America Ready for a President With a Mustache?